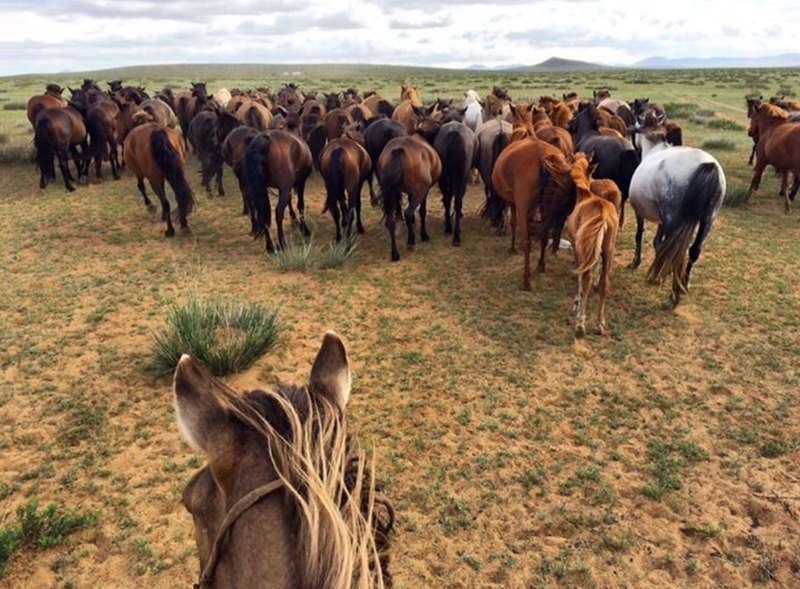 Thank you 🔷 @theworldbyhorseback 🔷 / Maria Nordvall from Gothenburg, Sweden, for taking us along on her trip through the Mongolian steppe and Gobi Desert. 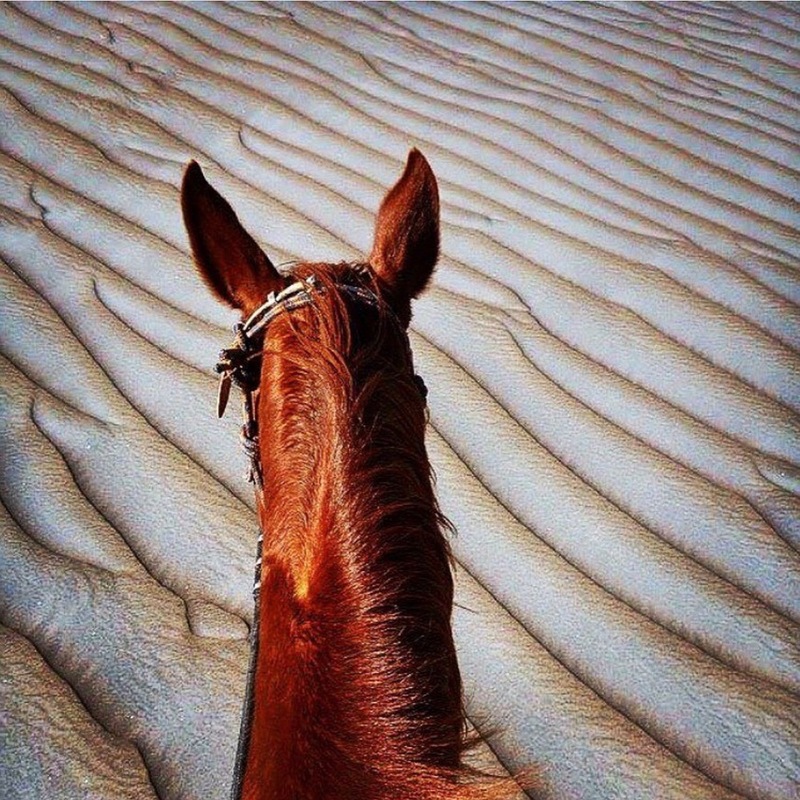 Check out her Instagram gallery for more beautiful photos that include camels, wild horses, and goats. Mongolia is a landlocked country in Central Asia and East Asia, located between China and Russia. The terrain is one of mountains and rolling plateaus, with a high degree of relief. The total land area of Mongolia is 1,564,116 square kilometres. Overall, the land slopes from the high Altay Mountains of the west and the north to plains and depressions in the east and the south. The Khüiten Peak in extreme western Mongolia on the Chinese border is the highest point (4,374 metres). The lowest is 518 metres, an otherwise undistinguished spot in the eastern Mongolian plain. The country has an average elevation of 1,580 metres. The landscape includes one of Asia's largest freshwater lakes (Lake Khövsgöl), many salt lakes, marshes, sand dunes, rolling grasslands, alpine forests, and permanent mountain glaciers. Northern and western Mongolia are seismically active zones, with frequent earthquakes and many hot springs and extinct volcanoes. The nation's closest point to any ocean is approximately 645 kilometres (401 mi) from the country's easternmost tip bordering northern China to Jinzhou in Liaoning province, China along the coastline of the Bohai Sea. Thank you 🔷 @greciasv 🔷 for taking us to Punta Delgada, in Veracruz. Designed to comfortably fit the shape of the horse’s skull, avoiding pressure on sensitive areas. The Micklem Competition bridle is a show quality bridle made from hand finished leather with soft padding on the headpiece, browband, noseband and cheekpieces. Comes with tongue protection bit clips and 2 sets of bit straps. Cannot be used as a bit-free bridle or lunge Cavesson. Show quality rubber reins included. Thanks to 🔷 @alixcritt 🔷 Alix Crittenden of @sleepingindianoutfitters for taking us 13,809 feet up to the Wind River Range in the Rocky Mountains. The Wind River Range encompasses an area of 2.25 million acres and forms a triple divide for three major western watersheds: the Columbia River, the Colorado River, and the Missouri. The Winds are the most popular section of the Bridger Wilderness of western Wyoming. This rugged piece of the Rocky Mountains, extending for approximately 80 miles along the western slope of the Continental Divide, contains a unique combination of jagged granite rock, alpine forest, and open alpine meadows. Serving as the headwaters for the mighty Green River, this wilderness holds 7 of the 10 largest glaciers in the Lower 48, more than 2,300 crystalline lakesand ponds, and numerous glacier-carved cirques, kettles, valleys, and hanging troughs. The high country typically opens up around mid-July and remains open through mid-September. Snow can occur at any time, however, and visitors should be prepared for the possibility of subfreezing daytime and night temperatures even in the summer. Afternoon thunderstorms, with lightning and rain showers, are common during the summer, and some of the peaks hold snow all year. Thanks to @oscarnmag for making my day with this quote. 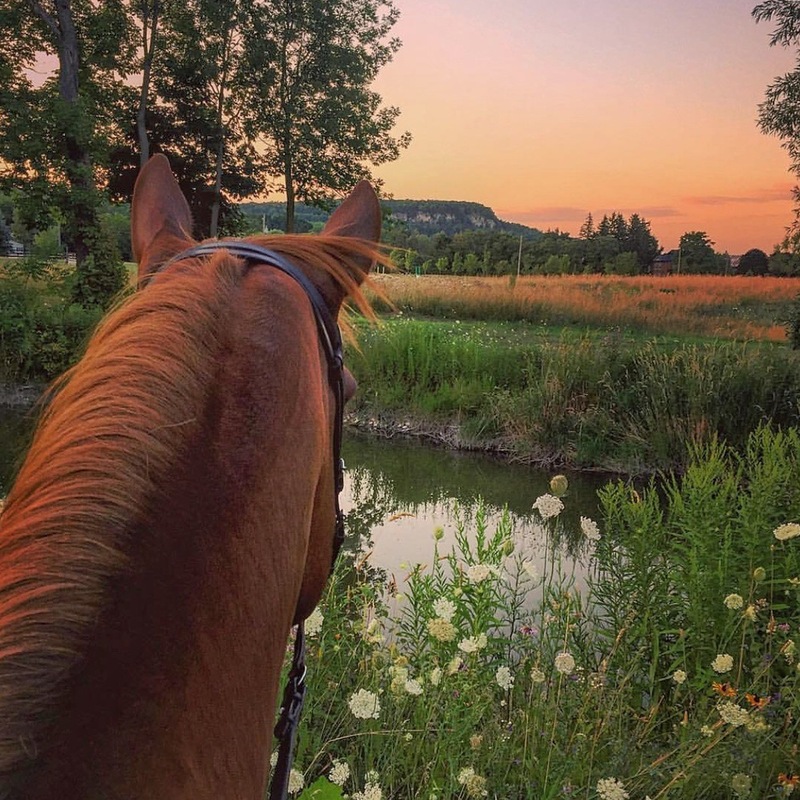 Thanks to 🔷 @casswies 🔷 at Wood View Stables, emphasis on the word view, about 45 minutes west of Toronto. The Niagara Escarpment is a long escarpment-- ( a steep slope or long cliff that forms as an effect of faulting or erosion and separates two relatively level areas of differing elevations -- in the United States and Canada that runs predominantly east/west from New York State, through Ontario, Michigan, Wisconsin and Illinois. It is composed of the Lockport geological formation of Silurian age, and is similar to the Onondaga geological formation, which runs parallel to it and just to the south, through western New York and southern Ontario. The escarpment is most famous as the cliff over which the Niagara River plunges at Niagara Falls, for which it is named. Designated a UNESCO World Biosphere,Reserve in 1990, the Niagara Escarpment is an internationally recognized landform and is the cornerstone of Ontario’s Greenbelt. A landscape of rich biodiversity, home to hundreds of Ontario's Species at Risk, vital watersheds, agricultural areas and 450-million year old geological history, the Niagara Escarpment is a treasure to protect for future generations. Hey Kids, guess who's finally giving her⭕️@pinterest⭕️ boards some love? No small task to catch up with over 800 posts but I'm getting there. Come join me! Time to check in with one of our most prolific and talented photographers. Thanks 🔷 @francb07 🔷! Arequipa is the colonial-era capital of Peru’s Arequipa Region. Framed by 3 volcanoes, it's filled with baroque buildings constructed from sillar, a white volcanic stone. Its historic center is anchored by the Plaza de Armas, a stately main square flanked on its north by the 17th-century neoclassical Basilica Cathedral, which houses a museum displaying religious objects and artwork. Where else would there be a town called Wolf? Thanks to 🔷 @kristindwyer15 🔷 for taking us through this dusty bit of real wild west, where the cattle and horses probably outnumber the people. It's post office closed in 1993, but Eaton's Dude Ranch, America's oldest dude ranch, has been here for over 135 years, and is where Kristin is lucky enough to work this summer. Equestrian sports are at risk in the Olympics. Please tag your posts about Olympic equestrians with 🔷 #TwoHearts 🔷 and 🔷 #JoinTheJourney 🔷 to help show support for our sport and ensure that we remain part of the Olympics. Thank you to 🔷 @noellefloydmagazine 🔷 for bringing these hashtags to our attention. Thinking of our friends and animals near the Soberanes Fire in Monterey County in California. Thanks to 🔷@coastallocal 🔷 for this dramatic landscape and smokey skies near San Fransisco. Be safe friends. Haystack Rock is a 235-foot (72-meter) sea stack in Cannon Beach, Oregon. It is sometimes claimed locally to be the third-tallest such "intertidal" (meaning it can be reached by land) structure in the world, but there are no official references to support this. A popular tourist destination, the monolithic rock is adjacent to the beach and accessible by foot at low tide. The Haystack Rock tide pools are home to many intertidal animals, including starfish, sea anemone, crabs, chitons, limpets, and sea slugs. The rock is also a nesting site for many sea birds, including terns and puffins. Thanks to 🔷@maybedeathisagift 🔷 for this windswept beauty from Lake Erie! 🌊💨🐴 Lake Erie is the fourth largest lake (by surface area) of the five Great Lakes in North America, and the thirteenth largest globally if measured in terms of surface area. It is the southernmost, shallowest, and smallest by volume of the Great Lakes and therefore also has the shortest average water residence time. At its deepest point Lake Erie is 210 feet (64 metres) deep. Lake Erie's northern shore is bounded by the Canadian province of Ontario, with the US states of Ohio, Pennsylvania and New York on its southern and easternmost shores and Michigan on the west. These jurisdictions divide the surface area of the lake by water boundaries. The lake was named by the Erie tribe of Native Americans who lived along its southern shore. That Iroquoian tribe called it "Erige" ("cat") because of its unpredictable and sometimes violently dangerous nature. It is a matter of conjecture whether the lake was named after the tribe, or if the tribe was called "Erie" because of its proximity to the lake. #3 in our feature of 🔷 @shineandride 🔷 and her adventures in Northern Italy: the spectacular Dolomite mountains, green meadows, world class ski resorts, outstanding wine-- what's not to love? Centrally located in Alta Badia, at 4,701 feet, La Villa is surrounded by the UNESCO natural parks of Puez-Odle and Fanes-Senes-Braies, and is next door to the the world famous ski slope, the Gran Risa, where the World Cup giant slalom takes place every year and directly leads into the centre of La Villa. Thanks to 🔷 @szendepende🔷 and her Arabian, for taking us to Kisbér, Hungary. Kisbér has been inhabited since the prehistoric age. Today about 8000 people live here - it is the capital of the Bakony foothill. The Rákóczi's Insurrection and the Napoleonic wars played an important role in its history. Its reputation is due to its horsebreed which is famous all over the world. The Battyány family developed a model-farm. In 1830 they had started the breeding of the English thoroughbred and not much later they established here a military studfarm. Later on this studfarm became a state property. The names of Kincsem, Imperial, Kisbér and other race-horses are known all over the world. The buildings of the stud farm have been declared historic monuments, the most notable among them - the Royal Riding Hall. Thanks to 🔷 @ltroldborg🔷 / Lisset Troldborg for taking us to the Jutland Peninsula, in Denmark. Although she is aboard an Icelandic, researching the area I discovered the Jutland horse breed. The Jutland horse can be traced back to the 12th century, although 9th century pictures of Danish warriors show them riding horses which appear quite similar to the modern Jutland. The Jutland was used not only in a draft horse capacity, but was also a popular mount for the knights of medieval times. They had both the strength and the stamina to excel at carrying the heavy armor, although now they are not commonly used as riding horses. There is a theory that the Vikings took Danish horses into England and that the Suffolk Punch developed from these, and there are certainly similarities between the modern Jutland and the Suffolk. During the 18th century, Fredericksborg blood was introduced to the breed which was responsible for improving their paces. The Jutland is also believed to have Cleveland Bay and Yorkshire Coach Horse blood, which is the combination that gives rise to its heavy, but attractive, draft appearance. The Jutland is closely related to the Schleswig Heavy draft horse of North Germany, which can also be traced back to Oppenheim.